Still looking for a unique gift? The Georg Jensen Variation Candleholder is more than just a candlestick, it's also a decorative bowl that can be used for a variety of stunning seasonal effects by adding your favorite winter treasures or treats like cinnamon sticks or Christmas candies. Once spring comes it's the perfect base for flowers, glass marbles or anything beautiful that inspires you. 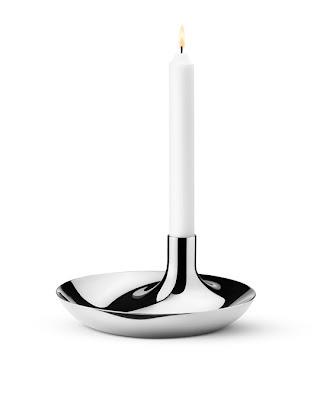 The Georg Jensen Variation Candleholder is available exclusively in the USA through Fjorn Scandianvian. This week only we are offering free Next Day Air shipping. Order as late as the 22nd and it will arrive on the 24th. But why wait? Just add 'FREE RUSH DELIVERY' in the comments section of your order and we'll dispatch it Next Day Air, free. Order Georg Jensen Variation Now.